First featured here in a January 17, 2011 posting about proposed anti-counterfeiting measures based on the structures present on the Blue Morpho butterfly’s wings, NanoTech Security is the subject of a profile in the Vancouver (Canada) Sun’s Dec. 28, 2015 Technology article by Randy Shore. They’ve managed to get themselves into the newspaper without having any kind of real news, research or business, to share. As is so often the case, timing is everything. This is a low news period (between Christmas and New Year) and the folks at NanoTech Security got lucky with a reporter who doesn’t know much about the company or the technology. When you add in low public awareness about the company and its products (you couldn’t do this with a company specializing in a well established technology, e.g., smartphones), there’s an opportunity. Landrock [Clint Landrock], the chief technology officer at Burnaby-based [Burnaby is a municipality in what’s known as Metro Vancouver] Nanotech Security Corp., has spun off his SFU [Simon Fraser University] research to found the firm, which is developing nano-optics for the global battle against counterfeiters. Colour-shifting holographic images, used as counterfeit protection on many banknotes, use technology that has been around for more than 35 years and they are increasingly easy to reproduce. Talented hobbyists can duplicate simple holographic features and organized criminals with deeper pockets can reproduce more sophisticated features with the right equipment. Nanotech Security hopes to take a quantum leap ahead of forgers. The detail and colour reproduction possible in Nanotech’s KolourOptick are dramatically better than the holographic images used on banknotes. “Right now, the fake holograms often look better than the real thing,” he said. Tiny structuresWhat [sic] Landrock found on the wings of the Blue Morpho was a lattice of tiny treelike structures that interact with light, selecting certain wavelengths to create a bright blue hue without pigments. I am perplexed by Blakeway’s ” … I really have not seen a commercialization of it that can make you money in the near term” comment. There are many nanotechnology-enabled products on the market ranging from coatings for superhydrophobic waterproofing products to carbon fibre-enhanced golf clubs to nanoscale chips for computers and components for phones to athletic materials impregnated with silver nanoparticles for their antibacterial properties (clothes you don’t have to wash as often) to cosmetics and beauty products, e.g., nano sunscreens, and there are more. Nanotech Security Corp. (TSXV: NTS) (OTCQX: NTSFF), (“Nanotech” or the “Company”) today released its financial results for the fourth quarter and year ended September 30, 2015. I’m curious as to how much of their revenue is derived from sales as opposed to research funding and just how much money does a 43% increase in gross margins represent? (Or, perhaps I just need to get better at reading news about *companies* and their finances.) In any event, signing two contracts and gaining interest in applying the technology to metal coins must have been exciting. This story goes to show that if you understand news cycles, have a little luck and/or know someone, and have a relatively unknown technology or product, it’s possible to get media coverage. This entry was posted in nanotechnology, Vancouver and tagged anti-counterfeiting, banknotes, blue morpho butterfly, Canada, Clint Landrock, colour-shifting holograms, counterfeiting money, Doug Blakeway. Bozena Kaminska, iridescence, KolourOptik™ technology, nano optics, Nanotech Security, optical thin film (OTF), Simon Fraser University on December 29, 2015 by Maryse de la Giroday. It’s always interesting to get some insight into how someone else sees the nanotechnology effort in Canada. First, there have been two basic approaches internationally. Some countries have chosen to fund nanotechnology/nanoscience research through a national initiative/project/council/etc. Notably the US, the UK, China, and Russia, amongst others, have followed this model. For example, the US National Nanotechnology Initiative (NNI) (a type of hub for research, communication, and commercialization efforts) has been awarded a portion of the US budget every year since 2000. The money is then disbursed through the National Science Foundation. By contrast, Canada has no such line item in its national budget. There is a National Institute of Nanotechnology (NINT) but it is one of many institutes that help make up Canada’s National Research Council. I’m not sure if this is still true but when it was first founded, NINT was funded in part by the federal government and in part by the province of Alberta where it is located (specifically, in Edmonton at the University of Alberta). They claim the organization has grown since its early days although it looks like it’s been shrinking. Perhaps some organizational shuffles? In any event, support for the Canadian nanotechnology efforts are more provincial than federal. Alberta (NINT and other agencies) and Québec (NanoQuébec, a provincially funded nano effort) are the standouts, with Ontario (nano Ontario, a self-organized not-for-profit group) following closely. The scene in Canada has always seemed fragmented in comparison to the countries that have nanotechnology ‘hubs’. The term ‘nanotechnology’ entered into the public vernacular quite suddenly around the turn of the century, right around the same time that, when announcing the US National Nanotechnology Initiative (NNI) in 2001 [2000; see the American Association for the Advancement of Science webpage on Historical Trends in Federal R&D, scroll down to the National Nanotechnology Initiative and click on the Jpg or Excel links], President Bill Clinton declared that it would one day build materials stronger than steel, detect cancer at its inception, and store the vast records of the Library of Congress in a device the size of a sugar cube. The world of science fiction took matters even further. In his 2002 book Prey, Michael Creighton [Michael Crichton; see Wikipedia entry] wrote of a cloud of self-replicating nanorobots [also known as, nanobots or self-assemblers] that terrorize the good people of Nevada when a science experiment goes terribly wrong. Back then the hype was palpable. Federal money was funneled to promising nanotech projects as not to fall behind in the race to master this new frontier of science. And industry analysts began to shoot for the moon in their projections. The National Science Foundation famously predicted that the nanotechnology industry would be worth $1 trillion by the year 2015. Is this a failure of vision? No. If anything it’s only a failure of timing. The nanotechnology industry is still well on its way to accomplishing the goals set out at the founding of the NNI, goals which at the time sounded utterly quixotic, and this fact is increasingly being reflected in year-on-year growth numbers. In other words, nanotechnology is still a game-changer in global innovation, it’s just taking a little longer than first expected. Although the Canadian government is not among the world’s top spenders on nanotechnology research, the industry still represents a bright spot in the future of the Canadian economy. The public-private engine [emphasis mine] at the center of Canada’s nanotech industry, the National Institute for Nanotechnology (NINT), was founded in 2001 with the stated goal of “increasing the competitiveness of Canadian companies; creating technology solutions to meet the needs of society; expanding training programs for researchers and entrepreneurs; and enhancing Canada’s stature in the world of nanotechnology.” This ambitious mandate that NINT set out for itself was to be accomplished over the course of two broad stages: first a ‘seeding’ phase of attracting promising personnel and coordinating basic research, and the then a ‘harvesting’ phase of putting the resulting nanotechnologies to the service of Canadian industry. I’d dearly like to know which recent developments indicate Canada’s industry has entered a serious commercialization phase. (It’s one of the shortcomings of our effort that communication is not well supported.) As well, I’d like to know more about the “… public-private engine at the center of Canada’s nanotech industry …” as Johnson seems to be referring to the NINT, which is jointly funded (I believe) by the federal government and the province of Alberta. There is no mention of private funding on their National Research Council webpage but it does include the University of Alberta as a major supporter. I am intrigued and I hope there is more information to come. My graduate research only served to increase my curiosity so I then did a pair of post-doctoral fellowships at the National Cancer Institute and the National Heart Lung and Blood Institute. When it seemed that I was a shoe-in for a life-long academic career, our technology garnered much attention and I found myself in the Bay Area founding the now award-winning Bikanta [bikanta.com]. Yet, that is what is happening. Federal funding peaked half a decade ago in 2010. [emphasis mine] NNI investments went from $1.58B in 2010 to $1.170B in 2015 (in constant dollars), a 26% drop. The number of nano-related papers published in the US were roughly 25 thousand in 2013, while the EU and China produced 33 and 35 thousand, respectively. I’m not sure why there’s a difference between Johnson’s ” … worth around $26 billion in [sic] last year …] and Bumb’s “… return on that investment has resulted … more than $1 trillion in revenue generated from nano‐enabled products.” I do know there is some controversy as to what should or should not be included when estimating the value of the ‘nanotechnology enterprise’, for example, products that are only possible due to nanotechnology as opposed to products that already existed, such as golf clubs, but are enhanced by nanotechnology. When I moved from the renowned NIH [US National Institutes of Health] on the east coast to the west coast to start Bikanta, one of the highest priority concerns was how we were going to develop nanodiamond technology without access to high-end characterization instrumentation to analyze the quality of our material. Purchasing all that equipment was not financially viable or even wise for a startup. We were extremely lucky because our proposal was accepted by the Molecular Foundry, one of five DOE [US Department of Energy]-funded nanoscience user facilities. While the Foundry primarily facilitates basic nanoscience projects from academic and national laboratory users, Fortune 500 companies and startups like ours also take advantage of its capabilities to answer fundamental questions and conduct proof of concept studies (~10%). I have to thank Dr. Bumb for pointing out that 2010 was the peak for NNI funding (see the American Association for the Advancement of Science webpage on Historical Trends in Federal R&D, scroll down to the National Nanotechnology Initiative and click on the Jpg or Excel links). I erroneously believed (although I don’t appear to have written up my belief; if you find any such statement, please let me know so I can correct it) that the 2015 US budget was the first time the NNI experienced a drop in funding. While I found Johnson’s article interesting I wasn’t able to determine the source for his numbers and some of his material had errors that can be identified immediately, e.g., Michael Creighton instead of Michael Crichton. This entry was posted in business, nanotechnology and tagged Ambika Bumb, Bikanta, Bill Clinton, commercialization, DOE, Michael Crichton, Molecular Foundry, nanobots, nanorobots, NIH, NNI, NNI 2.0, NSF, Patrick Johnson, Prey, US Department of Energy, US National Insitutes of Health, US National Nanotechnology Initiative, US National Science Foundation on December 28, 2015 by Maryse de la Giroday. When mixed with lightweight polymers, tiny carbon tubes reinforce the material, promising lightweight and strong materials for airplanes, spaceships, cars and even sports equipment. While such carbon nanotube-polymer nanocomposites have attracted enormous interest from the materials research community, a group of scientists now has evidence that a different nanotube — made from boron nitride — could offer even more strength per unit of weight. Carbon nanotubes are legendary in their strength — at least 30 times stronger than bullet-stopping Kevlar by some estimates. When mixed with lightweight polymers such as plastics and epoxy resins, the tiny tubes reinforce the material, like the rebar in a block of concrete, promising lightweight and strong materials for airplanes, spaceships, cars and even sports equipment. “The weakest link in these nanocomposites is the interface between the polymer and the nanotubes,” said Changhong Ke, an associate professor in the mechanical engineering department at the State University of New York at Binghamton. If you break a composite, the nanotubes left sticking out have clean surfaces, as opposed to having chunks of polymer still stuck to them. The clean break indicates that the connection between the tubes and the polymer fails, Ke noted. The researchers tested two forms of polymer: epoxy and poly(methyl methacrylate), or PMMA, which is the same material used for Plexiglas. They found that the epoxy-boron nitride nanotube interface was stronger than the PMMA-nanotube interface. They also found that both polymer-boron nitride nanotube binding strengths were higher than those reported for carbon nanotubes — 35 percent higher for the PMMA interface and approximately 20 percent higher for the epoxy interface. Boron nitride nanotubes likely bind more strongly to polymers because of the way the electrons are arranged in the molecules, Ke explained. In carbon nanotubes, all carbon atoms have equal charges in their nucleus, so the atoms share electrons equally. In boron nitride, the nitrogen atom has more protons than the boron atom, so it hogs more of the electrons in the bond. The unequal charge distribution leads to a stronger attraction between the boron nitride and the polymer molecules, as verified by molecular dynamics simulations performed by Ke’s colleagues in Dr. Xianqiao Wang’s group at the University of Georgia. “I think boron nitride nanotubes are the future for making polymer composites for the aerospace industry,” he said. This entry was posted in nanotechnology and tagged Binghamton University, BNNTs, boron nitride, boron nitride nanotubes, carbon nanotube-polymer nanocomposites, carbon nanotubes, Catharine C. Fay, Catherine Meyers, Changhong Ke, Cheol Park, CNTs, epoxy, Liuyang Zhang, Mechanical strength of boron nitride nanotube-polymer interfaces, nanotube-polymer composite, PMMA, PMMA-nanotube interface, poly(methyl methacrylate), polymethyl methacrylate (PMMA), State University of New York at Binghamton, University of Georgia (US), US, Xianqiao Wang, Xiaoming Chen on December 28, 2015 by Maryse de la Giroday. The Prize seeks to encourage education and research and is set to play the pioneering role in developing relations between science and technology institutions working in the OIC member countries. It also aims to improve scientific relation between academics and researchers to facilitate the growth and perfection of science in the OIC member states. The laureates in each section will be awarded 500,000 USD which is financed through the endowments made to the Prize. The winners will also be adorned with a special medal and certificate. The Mustafa Prize started its job in 2013. The Policy making Council of the Prize which is tasked with supervising various procedures of the event is comprised of high-profile universities and academic centers of OIC member states. The prize will be granted to the works which have improved the human life and have made tangible and cutting-edge innovations on the boundaries of science or have presented new scientific methodology. Dr. Hossein Zohour, Chairman of the science committee of Mustafa Scientific Prize, has announced the laureates on Wednesday [Dec. 16, 2015]. According to the Public Relations Department of Mustafa (PBUH) Prize, Professor Jackie Y. Ying from Singapore and Professor Omar Yaghi from Jordan won the top science and technology award of the Islamic world. Zohour cited that the Mustafa (PBUH) Prize is awarded in four categories including, Life Sciences and Medicine, Nanoscience and Nanotechnology, Information and Communication Technologies and Top Scientific Achievement in general fields. “In the first three categories, the nominees must be citizens of one of the 57 Islamic countries while in the fourth category the nominee must be Muslim but being citizen of an Islamic country is not mandatory,” he added. Professor Jackie Y. Ying, CEO and faculty member of the Institute of Bioengineering and Nanotechnology of Singapore and Professor Omar Yaghi, president of Kavli Nano-energy Organization and faculty member of University of California, Berkeley are the laureates in the fields of Nano-biotechnology sciences and Nanoscience and Nanotechnology respectively. These systems are consisted of polymeric nanoparticles, which auto-regulate the release of insulin therapeutic depending on the blood glucose levels without the need for sampling. The technology was first developed in her knowledge-based company and now being commercialized in big pharmaceutical firms to be at the service of human health. Professor Omar Yaghi, prominent Jordanian chemist, has also been selected for his extensive research in the field of metal-organic frameworks (MOFs) in the category of nanoscience and nanotechnology. It’s worth noting that this [sic] MOFs have a wide range of applications in clean energy technologies, carbon dioxide capturing and hydrogen and methane storage systems due to their extremely high surface areas. The Mustafa (PBUH) Prize Award Ceremony will take place on Friday December 25  at Vahdat Hall to honor the laureates. Unfortunately, I’ve not profiled Dr. Yaghi’s work here. Dr. Ying has been mentioned a few times (a March 2, 2015 posting, a May 12, 2014 posting, and an Aug. 22, 2013 posting) but not for the work for which she is being honoured. Congratulations to both Dr. Yaghi and Dr. Ying! This entry was posted in energy, medicine, nanotechnology and tagged Hossein Zohour, Institute of Bioengineering and Nanotechnology of Singapore, Jackie Y. Ying, Jordan, Kavli Nano-energy Organization, metal-organic frameworks (MOFs), Mustafa Prize, nanobiotechnology, Omar Yaghi, Organization of Islamic Cooperation (OIC), Singapore, University of California at Berkeley on December 28, 2015 by Maryse de la Giroday. It’s being described as a ‘jeweled nano-snowman’ but platinum and titanium aren’t my idea of jewels. Still, it’s a cheerful, seasonal greeting. Would a jewel-encrusted snowman make the perfect Christmas present? 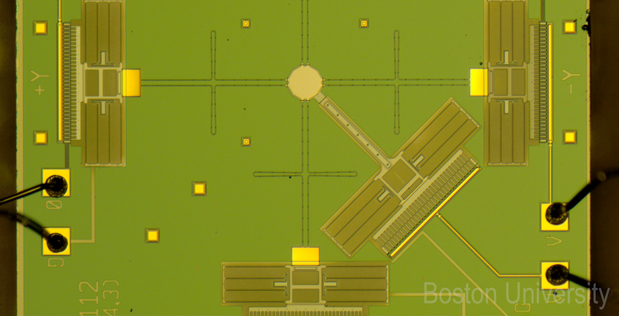 At only 5 nanometres in size, the price might be lower than you think. And it’s functional too, catalysing the splitting of water to make green hydrogen for fuel cells. The scientists did a little bit of work adding colour (most of these images are gray on gray), as well as, the holly and berry frame. Joyeux Noël et Bonne Année or Season’s Greetings! This entry was posted in energy, nanotechnology and tagged Caroline Blackmore, catalyst, nano-snowman, Nanoscale Physics Research Lab (NPRL), platinum, Ross Griffin, self-assembling, titanium dioxide, UK, University of Birmingham on December 24, 2015 by Maryse de la Giroday. “I’m happy to say I’m here today not to accept a medal but to announce one,” Hawking joked as he launched the medal at an event at the Royal Society, Britain’s de-facto academy of sciences. The winners will be announced at the Starmus Festival, a gathering celebrating art and science in Spain’s Canary Islands that will take place from June 27 to July 2 next year . A ground-breaking new award for science communication in honour of Professor Stephen Hawking was announced today at the Royal Society in London, by a panel including Prof. Hawking, the Starmus founding director Prof. Garik Israelian, Dr. Brian May [member of the band Queen and astrophysicist], Prof. Richard Dawkins [evolutionary biologist known for memes and atheism], Alexei Leonov and Nobel Laureate Sir Harold Kroto [one of the discoverers of buckminsterfullerenes, also known as, buckyballs or C60 or fullerenes]. I’m glad to see that science communication is going to enjoy some more recognition. STARMUS Festival was born with the aim of making the most universal science and art accessible to the public. Traditionally the perfect symbiosis between astronomy, art and music, STARMUS 2016 will bring together not only the brightest minds from these areas but many others besides, as we debate the future of humanity with scientists, business people at the cutting edge, and celebrities of all kinds. Join us for an event in Tenerife that rises to a level where others fail! That last line is a pretty bold statement. I wish the organizers all the best luck as they put the programme together and start attracting participants. This entry was posted in science communication and tagged Alberto Bernabé, Alexei Leonov, Brian Cox, Brian May, Canary Islands, Dara O'Briain, Garik Israelian, Hans Zimmer, Harold Kroto, Kip Thorne, lStephen Hawking, María Méndez, Richard Dawkins, Royal Society, Sarah Brightman, Starmus Festival, STARMUS International Science and Arts Festival, Stephen Hawking Medal for Science Communication, UK on December 24, 2015 by Maryse de la Giroday. It’s about time to catch up with Canadian rapper, Baba Brinkman who has made an industry of rapping about science issues (mostly). Here’s a brief rundown of some of his latest ventures. The digital animation is by Steven Fahey, who is a full time animator for the Simpsons, and I’m completely blown away by the results he achieved. The video is about the evolution of religious instincts, and how the secular among us can make sense of beliefs we don’t share. Humans haven’t learned much in more than 2,000 years when it comes to religion and politics. Religion has led to social tension and conflict, not just in today’s society, but dating back to 700 B.C. according to a new study published today in Current Anthropology . This entry was posted in performing arts, science, science communication and tagged Arthur A. Joyce, Baba Brinkman, COP21, Ensoulment Entrapment and Political Centralization A Comparative Study of Religion and Politics in Later Formative Oaxaca, Mesoamerica, Mexido, Patreon, politics, press conference on Moral Obligation – Scientific Imperative for Climate Matters, religion, Religion Evolves, Sarah B. Barber, Sarah Barber, Steven Fahey, The Rap Guide to Climate Chaos, University of Central Florida, University of Colorado, World Climate Change Conference 2015 (COP21) on December 24, 2015 by Maryse de la Giroday.